Signed A&BC card of Phil Beal the Tottenham Hotspur footballer. Home » Signed A&BC card of Phil Beal the Tottenham Hotspur footballer. Phil Beal. This is a fabulous signed A&BC card of Phil Beal the former Tottenham Hotspur footballer. This is number 54 in the series. It’s in good condition and Phil has signed using a fine blue sharpie. Phil Beal played 420 leagues games for Spurs between 1963 and 1975. 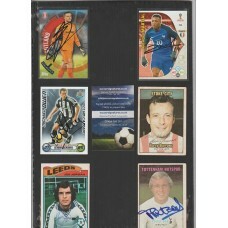 The soccersignatures.co.uk system will ask you to pay £2.69 P&P. Please do this and I will refund you £1.50 if this card is purchased as a single item order and not part of a larger order.